Since his Met debut in 1971, Maestro James Levine has collaborated with countless great singers, expanded the Met repertory in extraordinary ways, and launched the MET Orchestra’s annual concert series at Carnegie Hall, among other major milestones. Over the course of his four decades with the Met, Levine has elevated the quality of the orchestra, chorus, and ensemble to the highest level in the company’s history. Here are just a few of the highlights of his unparalleled Met career. 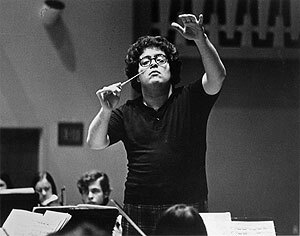 James Levine rehearsing circa his Metropolitan Opera debut with Tosca, June 5, 1971, at the age of 28. 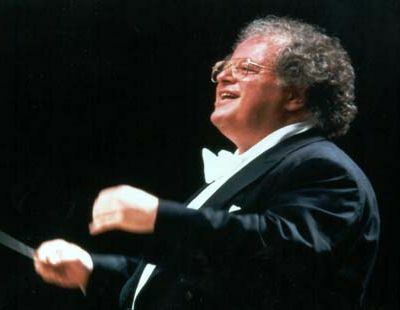 James Levine makes his Met debut conducting Tosca. Conducts the Met premiere of Verdi’s I Vespri Siciliani. Conducts the eleventh-hour Met debut of Kiri Te Kanawa in Otello. Other major artists to debut under Levine include Ben Heppner, Karita Mattila, Jessye Norman, Bryn Terfel, Tatiana Troyanos, and Dolora Zajick. Named Music Director, having been Principal Conductor since 1973. Conducts Puccini’s Il Trittico, in which Hildegard Behrens and Neil Shicoff make their debuts. Conducts the first Live from the Met telecast, a performance of La Bohème starring Luciano Pavarotti and Renata Scotto. Demonstrates his commitment to modern masterpieces by adding Berg’s Lulu to the Met repertory. Conducts an all-star Tannhäuser with a cast led by James McCracken, Leonie Rysanek, Grace Bumbry, and John Macurdy, with Bernd Weikl and Kathleen Battle making their debuts. With the new production of Die Entführung aus dem Serail, not heard at the Met since 1947, Levine begins building the Mozart repertory to include every major work. Conducts the company premiere of Kurt Weill’s Rise and Fall of the City of Mahagonny, starring Teresa Stratas, Richard Cassilly, Astrid Varnay, and Cornell MacNeil. A new all-Stravinsky program conducted by Levine features two Met premieres—Le Sacre du Printemps and Oedipus Rex—as well as Le Rossignol. Introduces Mozart’s Idomeneo to the Met, in a new production by Jean-Pierre Ponnelle, with Luciano Pavarotti starring in the title role alongside Ileana Cotrubas, Frederica von Stade, Hildegard Behrens, and John Alexander. Performs with Frederica von Stade and Nicolai Gedda at a special onstage recital celebrating Gedda’s 25th Met anniversary. It’s one of a series of recitals where Levine accompanies artists on piano, featuring such singers as Marilyn Horne, Christa Ludwig, Jessye Norman, Renata Scotto, and Martti Talvela. Appears on the cover of Time magazine in a profile that declares him as the premier American conductor on the international scene. Appears with Leontyne Price on “In Performance at the White House,” a televised concert with President Reagan in the audience and a number of young Met artists also performing. Performs in the Met’s two-part Centennial Gala, leading scenes from Der Rosenkavalier, Otello, La Fanciulla del West, Tristan und Isolde, and other operas. Adds Mozart’s La Clemenza di Tito to the Met repertory, with Kenneth Riegel, Renata Scotto, Gail Robinson, and Ann Murray in her company debut. Conducts the Met premiere of Gershwin’s Porgy and Bess, with Simon Estes and Grace Bumbry in the title roles. The Opening Night performance of Die Walküre marks the first part of a new Ring cycle, directed by Otto Schenk and designed by Günther Schneider-Siemssen, with Hildegard Behrens, Peter Hofmann, Jeannine Altmeyer, and Simon Estes in the principal roles and Maestro Levine on the podium. Levine’s 1089th performance, of Das Rheingold, exceeds Artur Bodanzky’s previous Met record (1,088) of most performances by a conductor. Leads the Met premiere of Schoenberg’s Erwartung with Jessye Norman, who also appears, with Samuel Ramey, in Bartók’s Bluebeard’s Castle. Conducts the first full cycle of Wagner’s Ring in nearly 15 years, in the new Schenk–Schneider-Siemssen production. Conducts the world premiere of John Corigliano’s The Ghosts of Versailles. Other operas commissioned by the Met under Levine include Philip Glass’s The Voyage, Tobias Picker’s An American Tragedy, Tan Dun’s The First Emperor, and John Harbison’s The Great Gatsby (see December 20, 1999). Launches the MET Orchestra’s annual concert series in Carnegie Hall, showcasing the ensemble in works outside the operatic repertory. Takes the MET Orchestra to Europe for Seville Expo ’92, the first of a number of international tours the orchestra would embark on. Other cities visited over the years include Tokyo, Frankfurt, Madrid, Vienna, Cologne, Hamburg, Prague, and numerous U.S. cities. Conducts a new production of Die Meistersinger von Nürnberg with Donald McIntyre, Karita Mattila, Francisco Araiza, and Hermann Prey. In the third season of Levine-led Ring cycles, Christa Ludwig sings her Met farewell as Fricka in Die Walküre. Leads his third Verdi premiere at the Met: Stiffelio, with Plácido Domingo in the title role. Adds another Verdi opera to the Met repertory: I Lombardi, with Luciano Pavarotti. 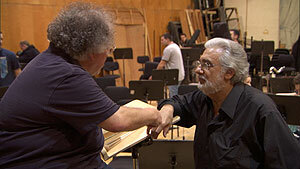 Metropolitan Opera Music Director James Levine and longtime collaborator Plácido Domingo rehearse Verdi’s Simon Boccanegra. Conducts a new production of Così fan tutte, with Cecilia Bartoli making her Met debut as Despina. Conducts a Saturday double-header of Verdi’s two final masterpieces, Otello and Falstaff, one of nearly 50 times he has led two performances at the Met in one day. Other memorable same-day pairings include La Bohème and Lulu, Ariadne auf Naxos and Don Carlo, and Elektra and Simon Boccanegra. Celebrates his 25th anniversary with the Met leading a gala performance of more than 50 Met stars in more than 35 different works. Conducts a new production of Berg’s Wozzeck, followed in November by a new production of Stravinsky’s The Rake’s Progress—two new stagings of 20th-century masterpieces in a single year. Conducts the Met premiere of La Cenerentola, with Bartoli and Ramón Vargas. Leads the inaugural concert of the MET Chamber Ensemble. Conducts the MET Orchestra in the world premiere of Milton Babbitt’s Piano Concerto No. 2 at Carnegie Hall. Other orchestral or chamber works commissioned by Levine include Charles Wuorinen’s Theologoumenon and Tıme Regained, William Bolcom’s Symphony No. 7, Hsueh-Yung Shen’s Legend for Percussion and Orchestra, and Elliott Carter’s In the Distances of Sleep. Brings Schoenberg’s Moses und Aron to the Met for the first time, with John Tomlinson and Philip Langridge in the title roles. Conducts the world premiere of John Harbison’s The Great Gatsby, commissioned by the Met to commemorate the 25th anniversary of his debut, with Jerry Hadley and Dawn Upshaw. A new production of Les Troyens premieres, with Levine conducting Deborah Voigt, Lorraine Hunt Lieberson, and Ben Heppner in the leading roles. Adds Berlioz’s Benvenuto Cellini to the Met repertory, with Marcello Giordani in the title role. Conducts Luciano Pavarotti’s farewell performance in Tosca. Other artists to have had their final performances under Levine’s baton include Marilyn Horne, Hermann Prey, Leontyne Price, Teresa Stratas, and Renata Tebaldi. Conducts the farewell of Mirella Freni, celebrating the 50th anniversary of her operatic debut and the 40th anniversary of her Met debut. Conducts a matinee of The Magic Flute to launch The Met: Live in HD, the company’s series of live performance transmissions to movie theaters around the world. Conducts the Met’s 125th Anniversary Gala, which is also a tribute to Levine’s longtime collaborator Plácido Domingo. Conducts the final cycle of Otto Schenk’s Ring production. It’s the 21st complete cycle of this staging—all of which were conducted by Levine. The premiere of a new production of Das Rheingold, directed by Robert Lepage, marks Levine’s 31st Opening Night, a Met record. After a season that includes new productions of Das Rheingold and Die Walküre, Levine takes the Met on tour to Japan, where he conducts Don Carlo on the 40th anniversary of his Met debut.